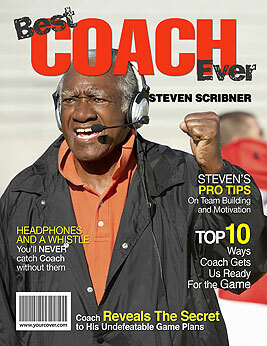 The Best Coach personalized magazine cover is a unique gift for thanking a coach for their dedication. The cover can include the coach's or the team's photos along with custom headline text all about the team, season and special memories. Need a gift for coach that shows how much you appreciate all the time and effort your coach has devoted to your team? A personalized magazine cover that features a photo of your coach or of the team is a unique coach gift that will be kept forever. Use the YourCover magazine cover generator to customize headlines to your coach’s likes and dislikes while including special memories and funny stories from the previous season. Choose from our wide variety of headlines so that when completed your coach gift will be a special memento that reflects a great season. Our one-of-a-kind back cover feature allows you to add a special message to your coach gift. You can say anything you want, for example you could add statistics from the season or mention the team members. Our purchasing options allow you to decide which of our personalized magazine cover products shows off your coach the best. You can choose a downloadable photo file to print yourself, or let us print and frame your coach’s gift for you. Rush shipping and international shipping are also available as well as a variety of frames, mugs, posters, and other accessories. When searching for a gift for coach, instead of the usual thank you card, create and personalize a fake magazine cover for your coach’s gift. You’ll be giving a personalized coach gift that’s as special as the coach starring on the front cover.